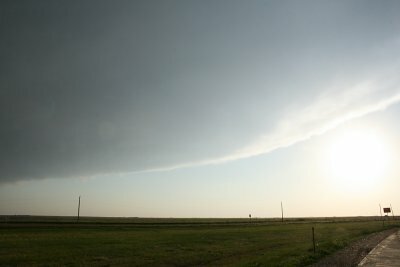 Today we went west from Perry, OK to encounter the expected dryline in the panhandle of Texas. 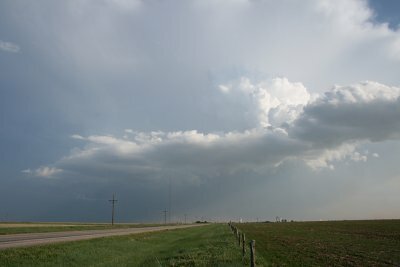 Things looked rather glum as we headed west to Woodward in low stratus and drizzle. Mid level storms had broken out across Oklahoma City and had raced northeast to clear the state by late morning. 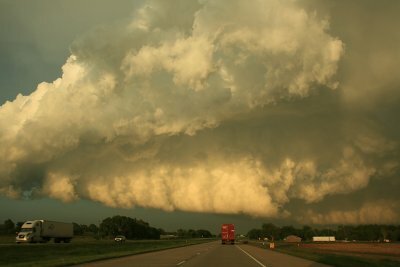 By early afternoon, we were heading towards Canadian with the hope of clearing the stratiform mist and drizzle blowing up from the south. 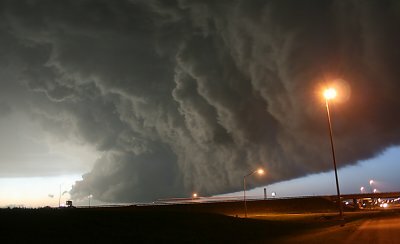 It was surprisingly cool, barely 65F (18.5C). As we arrived at Canadian, the stratiform cloud started to break and temperatures increased to the low 70's. We continued scouting west until we arrived at Pampa..here we could see the tops of storms over eastern Colorado and also weakish looking storms southwest of Lubbock. 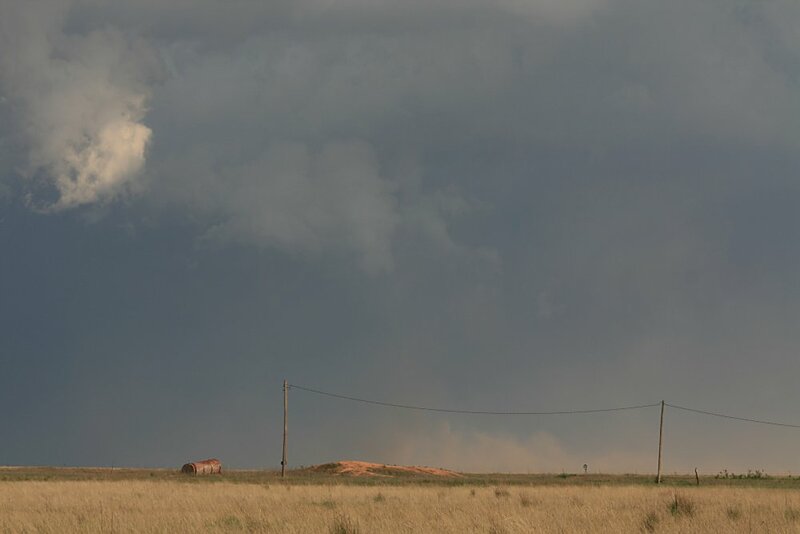 We decided to push west to Fritch and soon passed through a dryline where dewpoints fell from 19C to 14C! 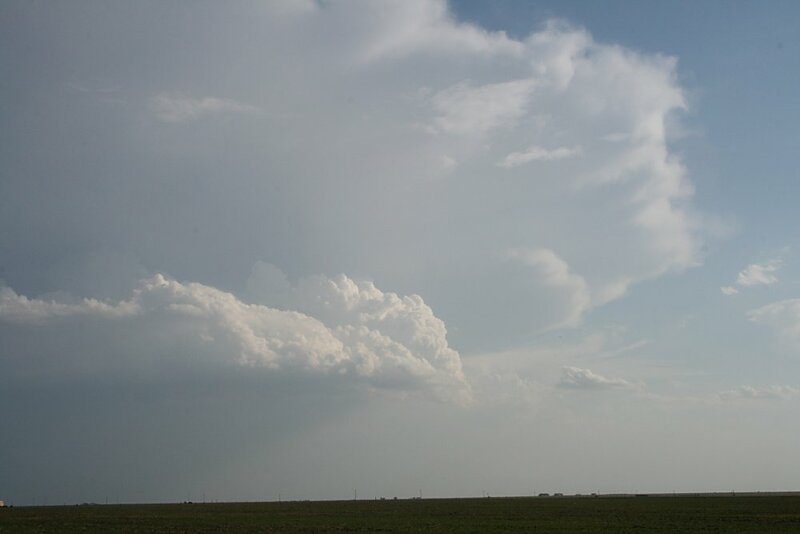 We became interested in a continued development of multicells southwest of Amarillo and made for the town of Panhandle to intercept a cell moving ENE. 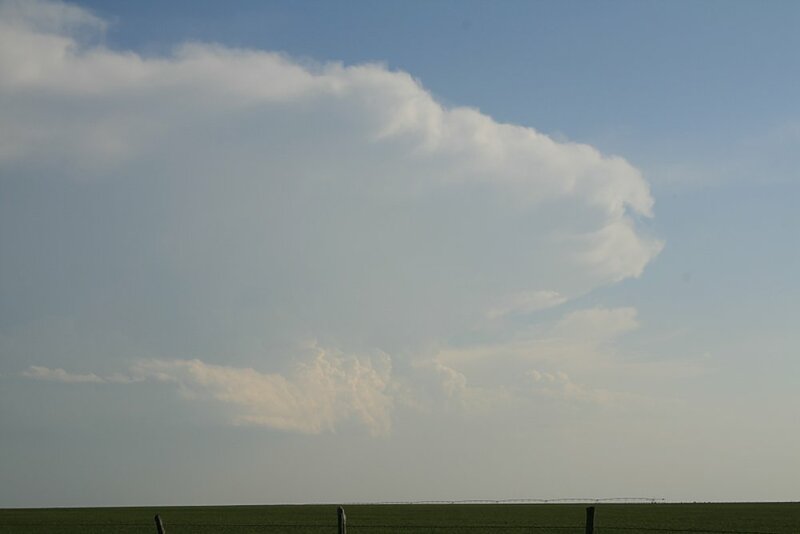 The cell initially appeared weak and high based, but kept a persistent anvil which occasionally backsheared. The storm appeared outflow dominated kicking up a narrow convective line on its northeast flank. 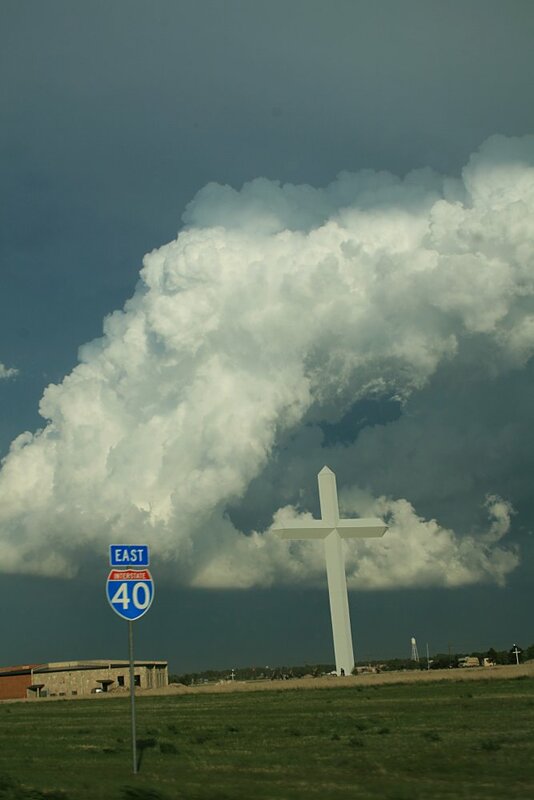 After 30 minutes or so, the NW end of the storm approached and from this time, late afternoon / early evening, we followed the storm east along I-40. 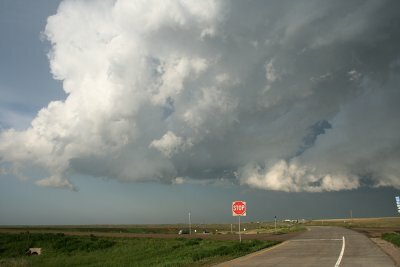 We watched this outflow dominated storm evolve from a high based multicell to severe storm status. 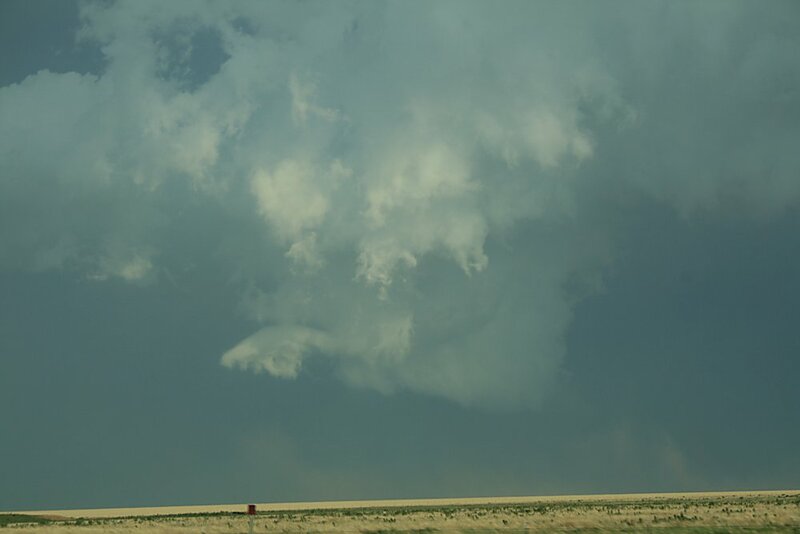 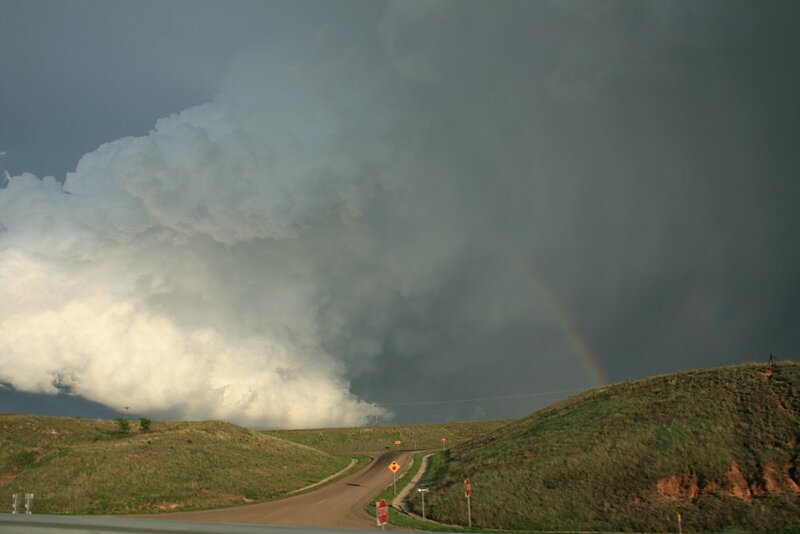 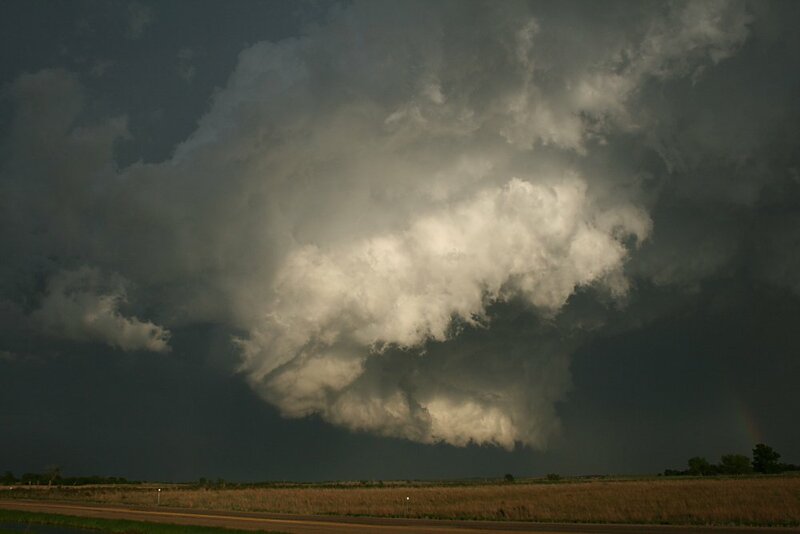 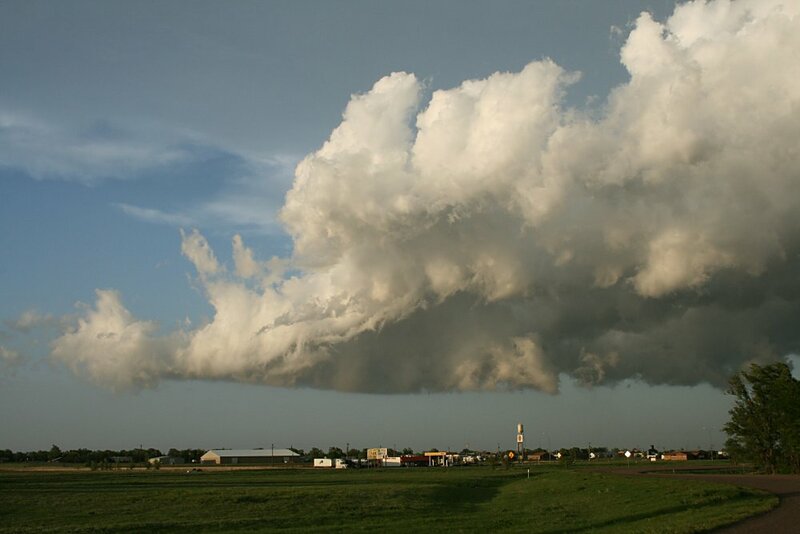 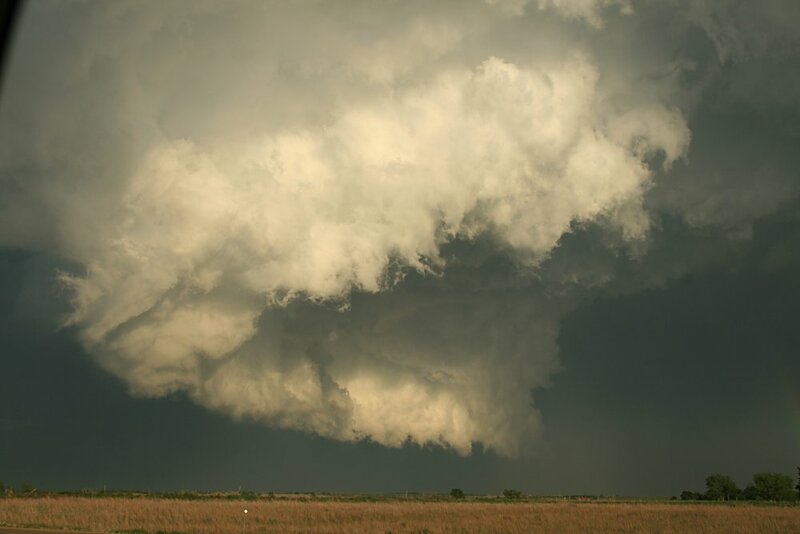 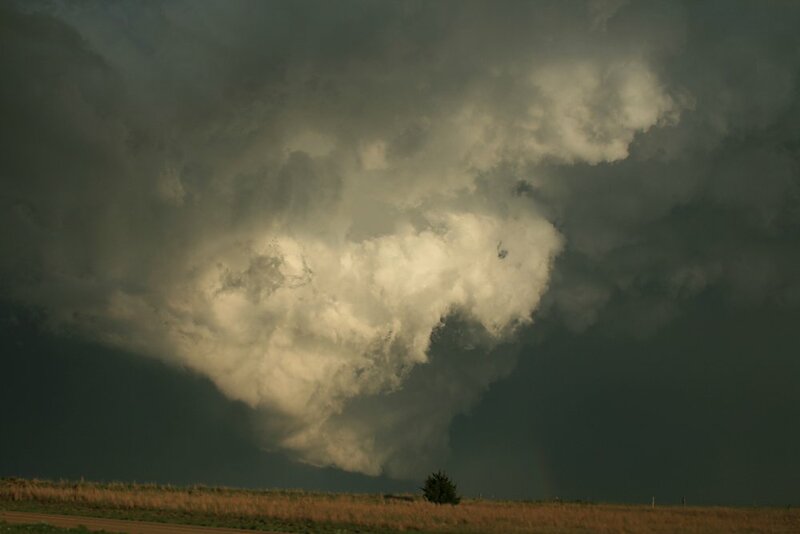 Eventually, it became inflow dominated and produced a magnificent arrangement of base features. As the storm moved into increasing moisture east of the dryline, it expanded in size and strength. 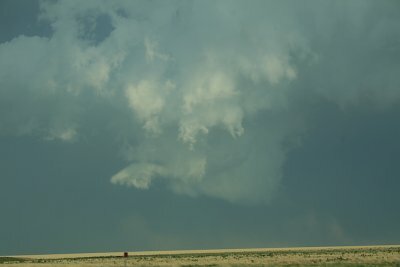 As darkness approached, lightning increased in intensity and we drove into golfball hail just west of Elk City. It was here that an 18 wheeler was apparently jackknifed and also reports of cars blown from the highway...we managed to pull off the Interstate to seek shelter in the reception driveway of a motel as winds gusted to more than 60mph and large hail continued. We are still overwhelmed and stunned by the imagery and power of this storm. 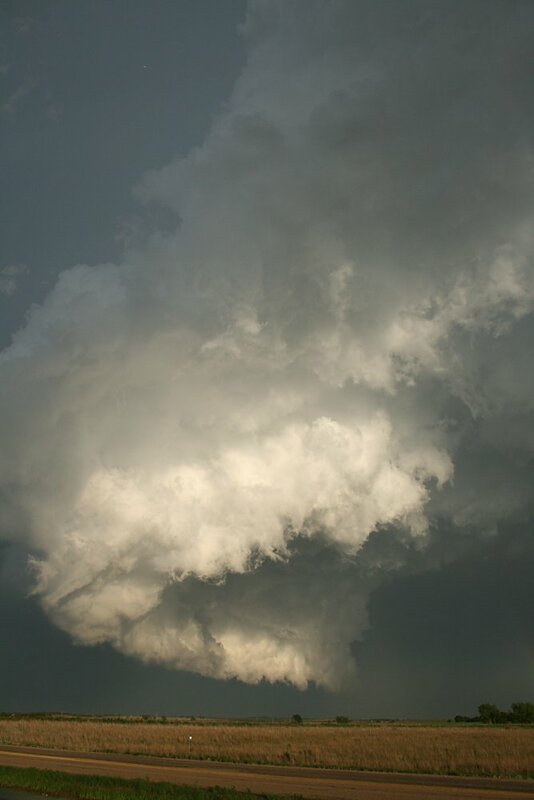 The updraft features became almost jaw dropping, could it get any better? The updraft core continuously changed its shape and appearance, and suspected outflow spoiling any prolonged form of organisation. 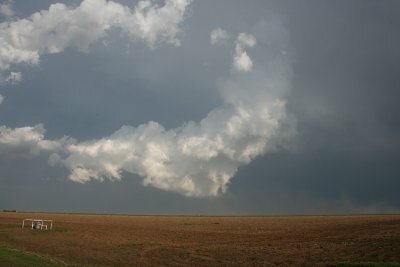 The main infeed alignment west of Elk City, OK. 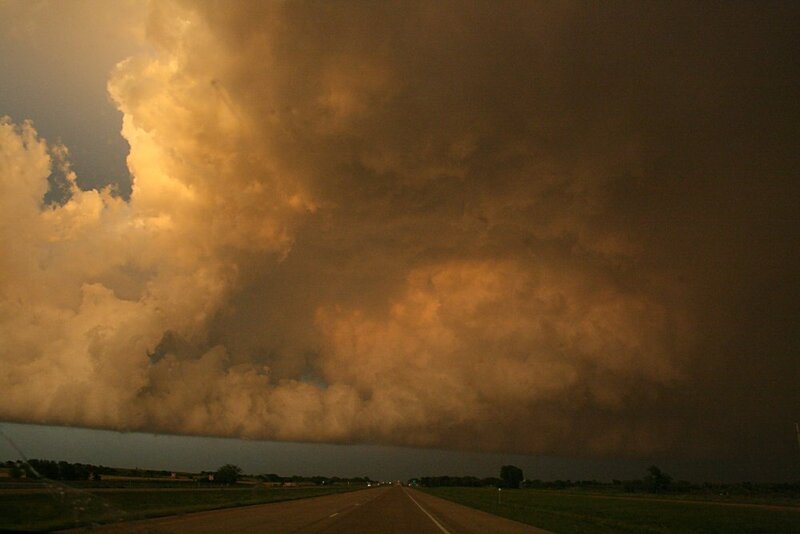 This image was taken not long before an 18 wheeler jackknifed and a number of cars were blown from the highway. 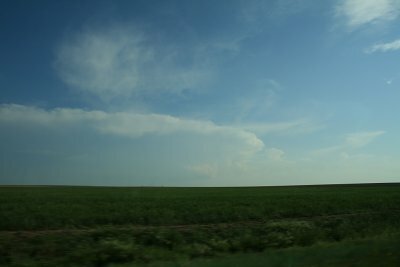 Note the extent of the overhead anvil spreading to the north in the distance.